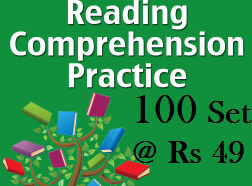 We are providing a collection of 100 Comprehensions prepared from recent news articles, In this PDF you will get objective questions for each passage so that you can check your comprehension skills as well. To buy this complete package you have to pay just 49 Rs. After paying, In next 24-48 hours, you will get pdf book of class notes in your same email id which you mention during making payment. For any doubts and queries, you can msg me at Facebook Page. 1. You will get good practice before the examination. 3. As the next comprehension in your exam will be picked from recent articles, if you prepare from 20-year-old comprehension book, it rarely helps, you need fresh practice from the place where the comprehension passages are picked in examination i.e Newspaper.